The Country of Grenada actually consists of three islands, Grenada, Carriacou and Petit Martinique and is one of the smallest independent countries in the western hemisphere. 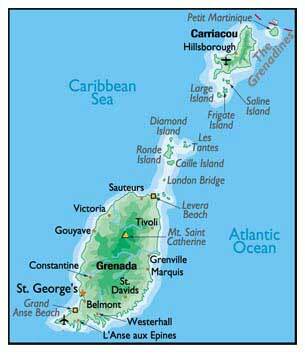 The Smaller Grenadines islands belonging to Grenada are Rhonde Island, Caille Island, Diamond Island, Large Island, Saline Island and Frigate Island along with many smaller cays. Located in the eastern Caribbean, Grenada is the southernmost of the Windward Islands and lies only 100miles north of Venezuela. The country contains 133 square miles with Grenada being the largest island of the group at 12 miles wide and 21 miles long. Most of the population lives on Grenada itself, and major towns there include the capital St. George's, Grenville and Gouyave. 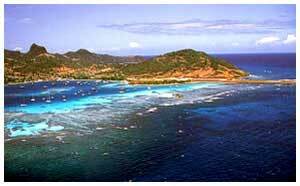 The largest settlement on the other islands is Hillsborough on Carriacou. The Islands are of volcanic origin and have extremely rich soil giving Grenada’s interior a very lush mountainous terrain with small rivers, cascading waterfalls that elegantly flow down to the sea and one of the most breathtakingly beautiful mountain lakes you will ever see. 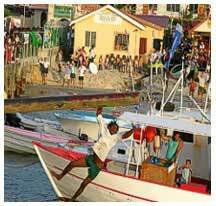 This varied environment offers sulphur springs, nature trails, exotic birds and fine sandy beaches edges with palm trees. These delightful islands are known for their sweet scents of cinnamon, cloves, ginger, mace, allspice and especially nutmeg. The spice industry in Grenada is second only to Malaysia for quantity but is rated number one in the world for the quality spices they export. Once you have left the yacht charter base, hoist your sails and let the steady trade winds carry you through the crystal clear waters. Explore these spectacular cruising grounds with line of sight navigation, pristine beaches and well protected, picturesque anchorages and harbours. Each mooring will provide you with a different reef profile and you can enjoy the diversity of the snorkeling and diving grounds, from brightly coloured soft coral, dramatic ship wrecks or sheer wall drop offs.